On 28-29 November 2018 a Regional Workshop “Direct negotiations of informal economy workers on implementation of the ASEAN Framework and Action Plan on the Declaration to Strengthen Social Protection” took place in Hanoi city, Vietnam. It was a follow-up event after the Exposure visit between organizers and leaders of ASEAN Trade unions and NGOs from Cambodia, Vietnam and Laos to SEWA Academy, India, which took place on 2-9 December 2017. The workshop was held in the framework of StreetNet -OXFAM partnership project aiming to: get a feedback from ASEAN Delegation Members on the lessons learned and progress made towards practical steps forward regarding Organizational Action Plan on informal economy workers; identify current challenges/gaps in three ASEAN countries and develop a future Activities Plan for the next three years of the project to promote the participation of representatives of workers in the informal economy in direct negotiations. In total 30 participants attended the workshop. Five people from Laos (LFTU and OXFAM Laos Program Officer), four people from Cambodia (IDEA), nine participants from VGCL, Vietnam. 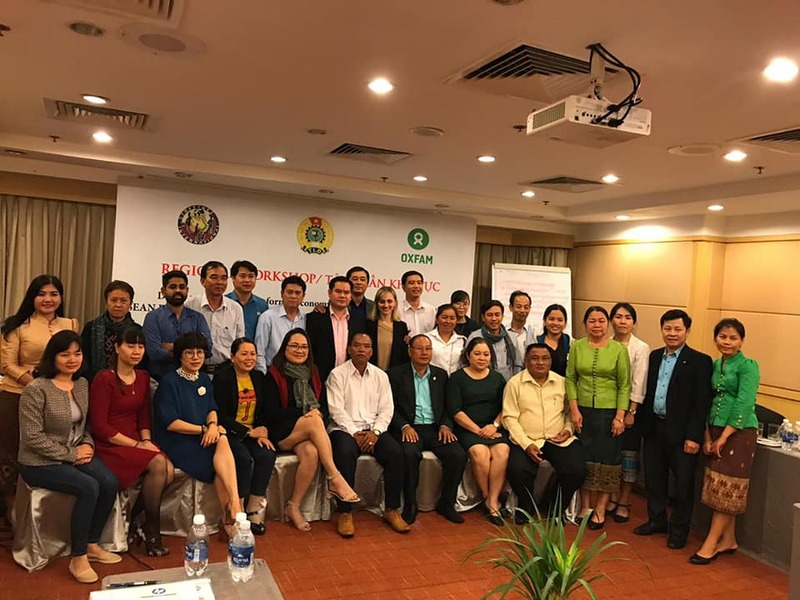 Also, representatives from other local NGOs, such as: GFCD, LIGHT, Women’s Union and OXFAM Vietnam Officer attended the workshop, which was hosted by Vietnam General Confederation of Labour, partner organization of StreetNet since 2014. Oksana Abboud, StreetNet Organizer welcomed the participants and briefly introduced the workshop, its aims and expectations as well as a pre-history of partnership with OXFAM in South Asian region. Brother Duc Vu Anh, VGCL Director of Organizing Department welcomed the participants and expressed the willingness of the VGCL to work jointly with StreetNet on organizing of informal economy workers in Vietnam as they adopted a new Resolution during their last VGCL Congress (September 2018) on organizing informal economy workers and structuring them into VGCL family. Brother Duc also noticed that through the syndicats, they try to organise informal economy workers of providing knowledge and making awareness to them. They try to include them in social insurance and labour contracts, for example, like it is happening with domestic workers. Also exist free legal services or training on health and safety for informal economy workers. In this background Brother Duc thanked StreetNet and Oxfam for providing such a platform to bring organisations to do better for informal economy workers. The workshop had several Sessions during which a different methodology has been used. During the first session Country teams’ presentations of the lessons learned from Exposure visit to India were introduced pointing on what can be replicated in their countries, when and how? All three countries noted that the Exposure visit to India was very useful and informative as they all learned a lot from SEWA (Self-Employed Women Union), which organizing models to use for informal economy workers, how to establish saving accounts for members and provide services for them and their family members; how to deal with recycling and organize waste pickers; how to move towards formalisation of informal economy and how to motivate workers particularly towards social security scheme, mainly – health scheme. Mr Vu Minh Tien, Director of Institute for Workers and Trade Unions of Vietnam quickly briefed about the situation of informal economy in Vietnam pointing on big changes which have happened in the world of work in the country for the last 10 years. He also raised the issue of lack of social security for informally engaged workers. Analysing challenges for informal economy workers in three countries focussing on commerce sector and finding practical solutions within organizations to tackle those challenges was a subject of the next session. Working in groups as per country, the participants identified all challenges for the street and market vendors and suggested solutions for them, namely: using new technology to disseminate information, including about contribution of women street vendors into national economy, creating groups in social media, strengthening educational programs on enhancing awareness among traders, continue to do more research and advocacy for child care for street vendors etc. At the end of the first Workshop Day, VGCL arranged a meeting with leaders of the syndicat of private kindergarten teachers of Hanoi city. Three teachers, leaders and activists of the syndicat shared experience of their activity and how they try to negotiate with the owner of the kindergarten many problems they face at working place. The second day was devoted to the ASEAN Framework and Action Plan on the Declaration to Strengthen Social Protection and planning for the future activities. Liza Ordonez, Social Protection Program Coordinator of Oxfam Cambodia Office introduced the ASEAN Framework and Action Plan on the Declaration to Strengthen Social Protection through a Skype video call. Liza concentrated on the aims of the Declaration as well as its implementation by the ASEAN Governments, which should be applied in accordance with the domestic laws and policies of respective ASEAN member states, nationally-defined social protection and its national priorities. Oksana Abboud made a Presentation on the situation with social protection for informal economy workers in Africa, focussing on African Union Social Agenda 2063 and some countries to show case how the workers initiate and promote a bottom-up social insurance and social security schemes. Representative of IDEA shortly briefed about general situation on social protection in Cambodia, emphasizing the draft Law on Social Protection which will include both formal and informal economy workers. Within next sessions the participants were working on identifying missing elements of social protection for all workers; developing plans what can be done by the organization at local, national, regional level towards organizing and negotiations for informal economy workers (taking into account the ASEAN Framework and Action Plan on the Declaration to Strengthen Social Protection). Planning of activities for the next three years of the project was well developed by the country groups prioritizing trainings on organizing informal economy workers in Vietnam, Laos and Cambodia. Closing speech was made by Brother Duc Vu Anh who one more time reconfirmed VGCL willingness to organize and protect all workers in Vietnam in a close partnership with StreetNet and OXFAM.